Top, my first ever view of the hearse. Above me and my car, a 1948 Buick Roadmaster based Hearse/Ambulance. This car was built from new as a dual purpose vehicle, known as a Combination, for Funeral and Ambulance use. Later in life it was painted white and may then have had a more ambulance based role. 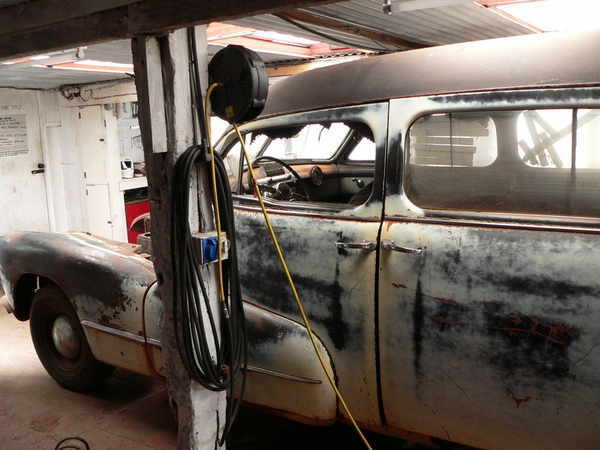 My plan is to do it up as original as possible for use as a hearse and wedding car for hire ! It's big! 21 feet or 6.3 metres long, 6' 3.5''/1.9m tall, max width 6'4''. It has a 5.2 litre,150 horse power straight eight engine, gearbox is ''Dynaflow" a kind of automatic transmission with a 1st gear which is for rapid accleration. 2nd gear is the drive gear. 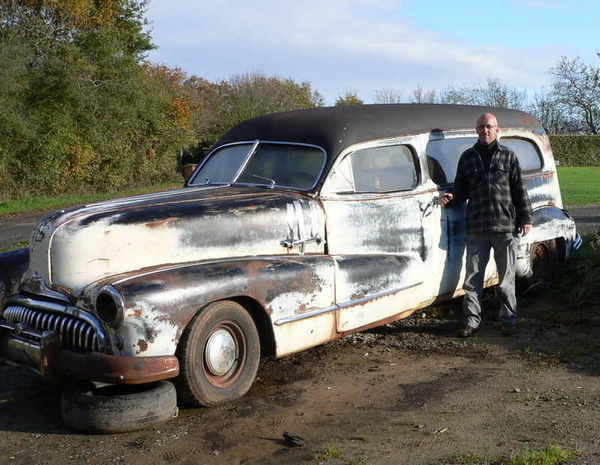 First year for the dynaflow was 1948 as an option on the Buick Roadmaster, it was standard on Flxibles of that year before becoming standard on Buick Roadmasters in 1949. The interior on this one was leather front seat leather lining and door trim and a vinyl headlining. The rear was trimmed extensively with mohair, leather lower door trim and a velvet headlining all in burgundy. 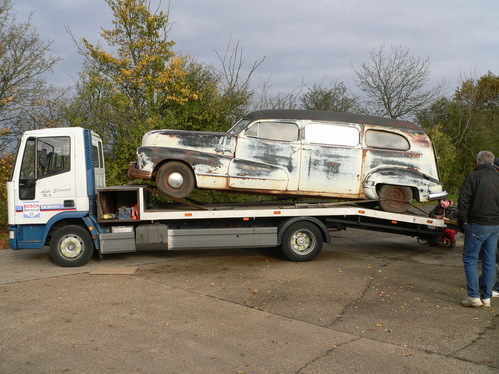 Photo below shows the car loaded near Chelmsford, Essex, England, UK for the journey to Norfolk. Built by the Flxible company in Loudonville, Ohio, the Flxible Professional cars ( Hearses, Ambulances and Combinations) had a very distinct look from the mid thirties up to 1948. Thereafter styling changed for much lower cars.During the period mentioned they raised the profile of the front end by welding in a seam to make the hood ( bonnet ) and firewall taller to keep the overall look of the car, with its large coach built body, aesthetically pleasing and in proportion. The rise was 5 & 5/8 inches! Flxible built the body and all five doors, stretched and strengthened the Buick chassis, uprated the rear suspension and used and adapted Buick Wheel arches, fenders, and several Buick fittings in their design. Generally, Flxible used Buick engine and rolling chassis but in some years they also used Cadillac and other luxury cars for,hearse, ambulance and combination cars. 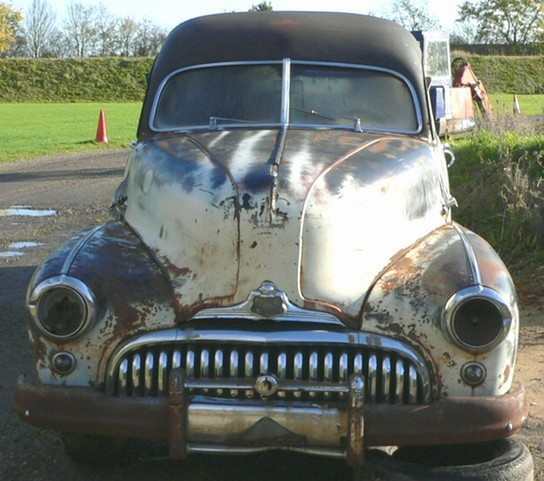 1948 was their most prolific year for professional cars, all Buick Roadmaster based, with a total of 646 in 1948. Funeral directors very often provided the ambulances and hearses over many decades in the U.S. and would run ambulances, funeral hearses and combination cars in various combinations depending on the size of their business or the town they were in. This combination was finished in black and looked just the same as a hearse from the outside, a carpet was used on this model to cover the coffin rollers when used as an ambulance, also there were sometimes cross emblems hung in the rear windows when serving as an ambulance. This car would have cost more than $5.3k when new, back in 1948! Thanks to Tom McPherson I now know the original owner of this vehicle was the Frank Funeral Home of Wellington, Kansas and it left the factory on November 7, 1948. It also once belonged to a rock band. Neil Young owned a 1948 Flxible Buick hearse or combination but I don't think it was this one as I believe his was fitted with a manual gearbox which suggests it was a late 47 based car. Many believe his song ' Long may you run' was written about his first hearse, the 48 which he called 'Mort' abbreviation for 'Mortimer Hearseburg',certainly not his Pontiac based 53 which was his second hearse. After the unknown rock band the next known owner was a guy in Kansas who never got around to doing the restoration. Possibly with him the car sat for decades without attention, as it surely has somewhere. Ok Oldies bought it from Kansas to Oklahoma and advertised it in Hemmings Auto News where a friend of mine saw it and told me about it and I bought it! August 2011 . After the initial work on arrival back in November to assess the condition of the vehicle and particularly the engine and gearbox. The Hearse is now back in the workshop. In November we failed to get the engine out. The picture below shows the vehicle over the pit in the workshop. It shows the rear bumper tilted upwards. This is due to a clumsy attempt at moving the vehicle with a forklift truck maybe when moving to OK Oldies in Oklahoma where I bought it from. Or sometime before that. The damage underneath looked recent. The fuel tank had been crushed. It really is lots of hassle getting something this big that doesn't run, moved around, and it's best to find someone who specialises in moving extra large non runners to avoid the cowboys who claim to be able to move such things on a budget. It took 5 weeks and 5 attempts to get this moved going the budget route, and I wouldn't recommend the guy who eventually did it. He was careful and it wasn't damaged but there was a considerable extra charge for loading on top of shipping not put in the 'quote'. Side view, not much roof clearance in the workshop ! The latest is the hearse is now almost just a body shell on wheels. The most major difficulty to date was drilling off all the door mountings from the pillars as these were held with crosshead screws which were seriously rusted. Thanks to a good quality set of drill bits, tough enough for stainless steel, all the doors were off in two hours! The rear side windows are out as is the windshield, revealing some serious corrosion inside, just above the windshield. A pattern will have to be made and this section renewed. Wings, inner and outer are removed. The Bench seat, removed from the cabin. In the rear, the wheel arch covers have been removed along with the rear door. The hearse went to Henham Steam Rally for the day, although many of the major parts have been stripped off, what remained in one piece made a very popular attraction at the Rally. 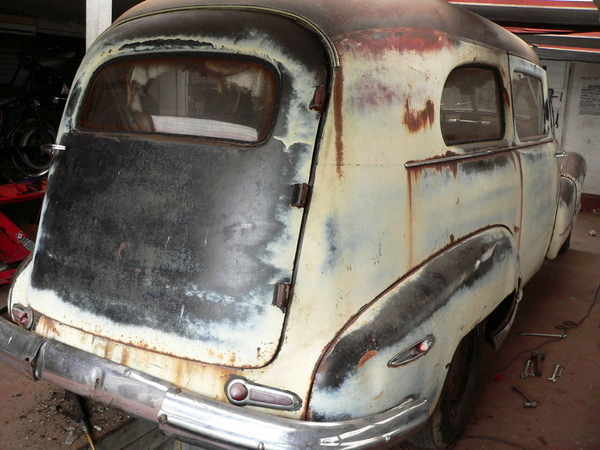 I have managed to get hold of some hard to get Buick parts, Rear bumper guards and the two cross-bars were missing. I have also got a lower cross-bar for the front bumper guards as mine was badly damaged. I also got reproduction badges from Bobs Automobilia for the bumper guard upper cross-bars. Engine work at the precision engineers completed and engine now back home awaiting reassembly . Meanwhile the dynaflow with torque convertor left yesterday for complete restoration. The latest is that there are many jobs in progress at the moment. Although there is nothing yet completed, good progress is being made: A hold up on the engine is because I decided to renew some of the valve lifters. I hadn't cleaned them and when I did some were not in A1 condition so they are coming with a consignment of; master cylinder, wheel cylinders X4, brake shoes, body mountings other bits and pieces. The front lever shocks have been sent to the States for rebuilding, Other suspension parts are being cleaned and powder coated in gloss black including springs and wheel backing plates, lower suspension arms. The restructuring of the rotten sun visor mounting has been completed. This was the most major reconstruction required on this vehicle. Other reconstruction now being done on the skins over the front door posts. Posts are solid, but have to be cut and rewelded to facilitate captive nut renewal for the door mountings. The gearbox is still away but expected anytime now. Engine work going on; Some time ago had valve seat work done, inlets were recut, exhaust seats were carefully cut for fitting of inserts, castings very thin so great care required! Checked seating of valves and grinding those needing perfecting, of these the recut inlets needed the least work. The inserts for the exhaust valves may have distorted a little on fitting or for another reason need grinding in. Am looking for as much contact as possible rather than the minimum I can get away with so some elbow grease required on some, but not all of them! Engine is cleaned and painted in original Buick turquoise of the period. Should really be back together very soon! Rear fenders, these are two door fenders, and were missing many of the flimsy mounting tags, mountings renewed or repaired as required and metal work straightened to original curves. Front lever shocks returned from rebuild in U.S. I bought a plasma cut exhaust manifold from Hells Gate Hot Rods in steel so my brother Kevin can make up a homemade stainless exhaust system with headers instead of the original cast iron manifold with its heat valve etc. This would have cost me around $1600 for the manifold parts going the original route. Too much money considering the modern alternative! The latest agenda is to sort out the mess at the bottom of the front door posts, several pieces of sheet metal need attention. Under body clean seal and paint working front to back. This has given me a lot to do as most jobs and parts of the car are at the front. Sorting bodywork may take priority over running the engine and gearbox so I will be going with the flow. Will probably paint fire wall and put in engine/gearbox radiator and run it before Spring. The rest of the engine bay is inner wings which are off and can be dealt with separately. Rebuilt gearbox is back home. Engine work not going so smoothly at the moment. Had a problem with certain engine components, that is the conrods on the crankshaft. The issue seems to be related to distorted conrod bolts needing to be in the exact same way as the when the conrod bearing machining was done. I was frustrated during the rebuild process to find that new conrod bolts were not available. From my mechanical background these would have been changed as a matter of course on an engine rebuild of this scale as the old bolts would distort over time. Ideally the machining would have been done with new bolts fitted. I got fed up and left the project over the Winter, getting other jobs done around the place. During the time of abstinance though, I have bought another load of parts. Shortly working most of the time on the hearse, hence my business open only two days a week this Summer. Managed to buy a new old stock Hood ornament, the famous Buick Bomb sight. Also Monday 18 March took radiator to Express radiators,Norwich, for rebuild and they have already done it! Collecting Tuesday. The latest is rear door frame work has begun. The rear door frame is wood, carries the well built, heavy, rear door. This, to me, was seen as the hardest part of the restoration. Requiring total reconstruction, although some parts could be refitted. Other woodwork also being done now is bulkhead repair. The bulkhead had been badly hacked to open up the front and rear I think by the band when they had it. The new top part of the bulkhead will carry a solid, and not a sliding, window as originally fitted. Also a rear seat modelled on the front seat is being worked on. It will be just over 1.2m or 4 feet wide and provide spacious seating for two,when the car is fitted out for a wedding etc. Under floor cleaning, the removal of undershield, is well underway in preparation a new coating. Welding/reconstruction of bottom of front doors sheet metal is in danger of completion this week! The latest news is engine and gearbox refitted to car, not running yet but engine has been spun over on the starter motor which has been reconditioned. Rear fender skirts have been made from new. Wheels have been acquired or refurbished( had to buy a couple from the states) for the original look and to handle the 8.90 -15 tires which were fitted for the first time on these cars in 1948 when buick brought out their 6.5 inch wide rims. These tires made the vehicle around an inch and a half taller than the preceeding model years making this the tallest flxible in many years, subsequent years 1949 on, were lower due to radical style change with a lower look. An exciting stage reached with the engine first fired into life on Jan 31st for a couple of minutes. Between then and Feb 14 it was started for short bursts up to 6 minutes. On the 14th it was run for a solid 30 minutes from warm and in total ran for over an hour that day. This week more parts from the States including new roadmaster scripts, rear wheel seals and gaskets and a new fan belt. Down the road at the powder-coaters 2 more wheels and rear springs in black of course. Also the inlet manifold (black) and stainless exhaust header (silver) ceramic coatings should be ready for collection, then can run again at weekend. Away are my lever action shocks which are in progress-awaiting more news. Lever action shocks are in progress away. Exhaust headers developed lots of pinhole leaks after blasting for ceramic coating. Further pinholes developed after fitting and then running engine. Exhaust has now been pressurized to show any more potential holes then welded. Steering wheel restoration underway. Shocks returned, obviously rebuilt and now fitted. Exhaust header has been more trouble than it's worth with lots of distortion after further welding. Still currently no use at all! Vehicle steers and runs good. Has not moved under its own steam yet. Exhaust header sorted but was a real pain due to welding and distortion but finally very good. Rear springs and shock absorbers fitted. Rear wheel bearings and seals renewed. New oil in axle. New brakes fitted, but no pipes yet. Rear door and drivers side doors and fenders blasted and in primer but not fitted. Engine run on frequent occasions. Stainless exhaust 2/3 complete and fitted.